Whether you want to add a special touch to a handmade gift or you want to make sure your clothing and other personal items are clearly identified, there are a number of places to find sew-in labels. More durable than their iron-on counterparts, these identifiers are designed to be sewn on to everything from quilts to clothing. They come in all shapes, styles, and sizes, so there's sure to be one that's perfect for your situation. You can find a few non-personalized sew-in labels at your local fabric or craft store but for the best selection, you should look online. The following retailers have some great options, no matter how you plan to use your labels. NameMaker offers a wonderful array of sew-in labels, many personalized according to your specifications. You'll find everything from simple name labels in various sizes to larger options featuring images of sewing machines and other items. You can also purchase non-personalized, adorable vintage-style labels where you can write or embroider you name before sewing. A set of 50 personalized labels starts at about $32, and the vintage-style labels retail for under one dollar apiece. NameMaker has been in the label business for over 75 years, and they have an A+ rating from the Better Business Bureau (BBB). They do not accept returns since most products are customized. If you're looking for custom-made personalized labels, check out Heirloom Woven Labels. This small company prides itself on high quality, and you can buy everything from designer labels to clothing care tags. To customize your label, you first select the style. Then you can choose the text type and a cute motif. The motif options include a vintage sewing machine, a spinning wheel, a spool of thread, and many others. You can buy the labels in quantities from 36 to 1000, and prices start at about $16 for a set of 36. Heirloom Woven Labels does not post its return policy, but it does have an A+ rating from the BBB. If you're looking for basic personalized labels at an affordable price, The Name Label Company is a good option. Their labels are very simple, most featuring just a name on a white or black background. Some of the options feature text printed on the label, and others offer embroidered names or messages. Prices start at about $13 for 48 printed labels or about $18 for 72 embroidered labels. The Name Label Company does accept returns in some cases, but you'll need to work with customer service to see if your situation is eligible. According to Honest Mummy Reviews, the quality of the labels is wonderful and the service is very quick. Another good option for customized labels is ABC Name Tapes. They offer an astounding selection of options. You can choose from one to four lines of text, lots of different background and text colors, several fonts, and three different widths. You can also add the motif of your choice. The labels come on a roll, and you simply snip off the label and sew it on. A simple design starts at about $40 for a set of 50. Although there are no reviews of ABC Name Tapes, the company has a satisfaction guarantee and a lifetime warranty. You have 60 days to return any purchase. Fabric.com carries LaMode Love Labels, which come in a variety of non-personalized designs. Although these labels are marketed as "iron-on," they are also well-suited to sewing. They make an affordable alternative to personalized labels since a pack of four costs less than $1.50. 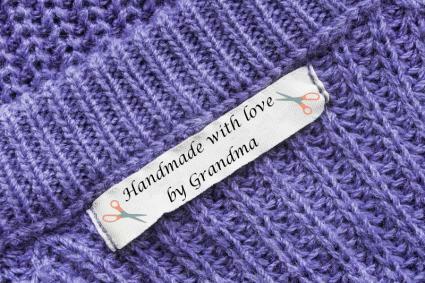 There are several styles to choose from, including Made with Love by Grandma and Owl You Need Is Love. Reviewers on Fabric.com state that the labels are beautifully made and that they sew in without any trouble. Fabric.com accepts returns withing 30 days and has a BBB rating of A. From simple labels to help your kids keep track of their clothing to custom designs that you can sew into hand-crafted items, there are lots of great options out there. Knowing where to shop can help make the experience of buying and using your labels stress-free.